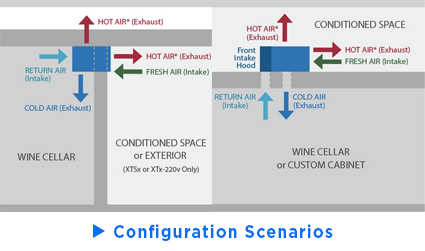 CellarPro's 1800QTL wine cooling units (1/8 Ton Nominal) were engineered to provide super-quiet temperature and humidity control for small to medium size wine cabinets. Performance testing shows that this compact unit maintains optimal cellar temperature and humidity conditions more effectively than similar units from competing brands. 1800QTL units also are significantly quieter than comparable units from other brands. Visit our learning center for performance and comparison tables and charts. Visit our Learning Center for data tables, performance charts and product comparisons among different brands. CellarPro 1800QTL units are sized to replace Breezaire 1060 and Wine-Mate 1500 cooling units. Please confirm equivalent dimensions and airflow prior to purchase. CellarPro 1800QTL Cooling Unit (P/N 1151). 1800QTL cooling units provide gentle cooling and the quietest noise level among all CellarPro cooling units. CellarPro engineered the 1800QTL for small wine cabinets that are placed in common living areas. All air-cooled refrigeration equipment requires fresh air intake to dissipate the heat generated by the cooling unit. The fresh air intake CANNOT come from the wine cellar space - it must come from space outside the cellar. Designed for indoor use only, 1800QTL units are preferred for temperature-controlled conditions that don't exceed 85F. The 1800QT requires fresh air intake at the rear of the cooling unit. This unit was not designed to be ducted. The replacement unit arrived ahead of schedule and in fine condition. It was used to replace a Breezaire 1060 unit that lasted 15 years. I followed the instructions and the replacement went very smoothly, even if the new CellarPro unit seemed a bit heavier than the old unit. The CellarPro 1800QTL seems quieter and more efficient than the old unit (the new one actually shuts off on occasion!). Very pleased so far. My only complaint is that the mounting clips should be included given the price of the unit. My replacement unit was shipped from CA to TN. Arrived in good condition. Great packaging. Old unit popped out just fine. New unit popped in just as easily. Fired it up a day later and after a week we're humming along between 58 and 62! Sante! I have a cabinet type wine cooler, and the original cooling unit died. The Cellar Pro replacement seemed more highly recommended. Ordering the unit on-line was easy, and the delivery was very quick. I am not too handy, however I was able to fairly easily replace the old unit myself. It’s been running and doing the job well and is very quiet. From the phone call to the CSR I worked with thru installation this was a breeze. My recent exchanges with AT&T and DIRECTV have been a nightmare. My interaction with CellarPro was so nice I felt like the world was right again. The unit is super heavy (60#) in terms of one person installation but even at 61 years old I was able to accomplish in no time. Great product, great people as it should be for a cellar protecting great wine!!! The 1800QTL is a huge improvement over the original Breezair unit that it has replaced. Much quieter and quality construction. The Customer Service provided offers alot of positive confidence and support. Company is really customer focused and easy to work with, and ensures you get what you need. This unit replaces the same CellarPro 1800QTL which lasted 7 years and worked flawlessly... seems like it should last longer, like a refrigerator. The unit arrived ahead of schedule with all the right parts. Thier on-line video also helped with the replacement. Highly recommend. This unit replaced a previous CellarPro unit that lasted only 6 years. I see from other comments that's about normal. But a refrigerator that costs that much will last at least twice that long. Anyway, this one installed easily, came with all the right bits and pieces, and is much quieter than the original one. So I'm happy with it. This a replacement for a 5 year old Cellar Pro. We are disappointed that the 1st unit only lasted 5 years and 4 months. We expected a much longer life The new unit is very quite. It is holding the temperature and the humidity where it is set. Customer service was accommodating. The unit arrived ahead of schedule. I am extremely pleased with the unit as well as with the people I dealt with. I will recommend your company without hesitation. Thanks so much for being there for me and our wine. I had my most recent unit for approximately 4 years before it stopped cooling. Fortunately it was still u der warranty, so a refurbished unit was sent. Customer service was easy to work with. I think these are good units, but according to my experience and other reviews, I'm not sure I'd expect them to last 20 years. They seem to have a life span of maybe 4-6 years. However, during those years you'll be very happy. The Cellar Pro cooling unit is quiet and efficient. A big improvement over the original unit delivered in my Le Cache cabinet. Arrived when expected. Unit easily fits in existing space. AC outlet on this unit allows connection of cabinet interior lighting. Recommend this as a replacement cooling unit. It fit, it arrived in a timely manner with good instructions on installation and it works. In use only 10 days--so the long term is unknown--but: Replacement for Breezaire WKCE 1060. So far, the unit has been distinctly more pleasant company--much quieter, with control panel much more convenient to use. Purchase communication with CellarPro very pleasant; shipping remarkably swift. Everything fit correctly with no problems. Unit is quiet and efficient, maintains constant temperature. Very pleased with upgrade of prior unit that lasted 9 years but was never as good. I installed my new CellarPro unit and it runs great and way more quiet than the old BreezAire unit. You were correct, the BreezAire probe will not work. I will jump on your website and order up the probe. Thanks for the great support! I'm looking forward to having a cool wine chest after I replace the existing unit with this ultra quiet one. Many Thanks for all of your assistance. I bought this unit to replace a Breezeaire unit that finally gave out. Everything was great on ordering and getting the unit. The only problem I had was the old saddle was just a hair to small for the new unit. I called customer service and they fixed the problem by sending me a new saddle. Replaced a Breezaire unit that worked constantly to maintain temp. This unit cycles on and off to maintain temp and seems to be keeping a more constant temp.Very much like the digital display panel - the unit sometimes runs with fan only - even more evidence that the compressor is not being overtaxed. Very good customer support for replacement unit. Instructions good but some warning that the light needs to be reversed would help. Unit shipped with new bracket which is too small for original bolts...so keep your original brackets. Much better unit that my previous 2 Breezaire units. Delivery was quick and installation and operating instructions were simple. Customer service person was very helpful in selecting the proper unit for my cabinet. Have had the unit installed now 2 weeks but runs quiet and maintains temps between 58 and 61. May want to crank it down to 55 in a week or two but will check instructions and see. We've had a LeCache 1400 cellar since 2007 and replaced the original Breezaire unit twice under warranty, which had expired when it started to act up about a month ago. Decided to handle the install ourselves, which went very well. The hardest part was lifting the new CellarPro unit into the cellar - definitely a two person job. The new unit is much quieter and maintains a temp between 58 and 61, with full load of 130 bottles. Highly recommend IWA for their always helpful customer support. The 1800 QTL has been operating for about a month now. It has been holding the the temperature in my cabinet at a constant 58 degrees as measured in the middle of the cabinet. After initial installation it has settled into an operational cycle of 6 minutes on and 4 minutes off. The ambient temperature of my room is a pretty constant 77 degrees at this time of year. This unit runs much quieter than the WM1500. Very pleased thus far. I have now had the CellarPro installed for about a week, and am quite pleased with it. It is working quite well, and keeping the cellar at about 59 degrees. The back exhaust is, IMHO, a much better option than the top exhaust of the old Breezeaire. A few comments or things to watch for: 1) depending on the installation, you may need to do some modification of your cellar cabinet to make the CellarPro fit. My cellar has a "notch" cut out of the back, and the old breezeaire sealed against the front panel of the chiller, which was flat. The Cellar Pro has a perforated grill on the front panel which stands out about 3/16 inch or so, and runs part-way across the unit, and so I had to do some work to get a good seal in the front. 2) The clips (if you need to use them) likewise make the job of sealing the unit a bit of a challenge. Both of these issues are specific to the type of installation I have - i.e. the chiller sealed along the top front edge of the unit and along the sides of the unit. Installations where the unit was contained within the cellar enclosure would not have these issues. Take a look at as many of the installation drawings as possible, and you will be able to figure out how this can work for you. Also, these are minor issues to deal with in exchange for much greater reliability. I finally decided to replace the BreezeAir unit in my LeCache cellar. The salesperson was knowledgeable and led me through the steps to replace with the CellarPro 1800QTL. I would recommend two people to handle the installation. The only modification was to file away a small amount in the rear opening for a perfect fit. The new unit has worked well, now into the third week. It is quiet, and after the first week it has maintained my desired temperature--as advertised. Bryan Adams' sales expertise and helpfulness made this replacement a real 'breeze'. As advertised the new Cellarpro unit fitted exactly where the old one was and installation was no problem for a friend with strong arms (the unit is heavier than the Breezair!!). Only one issue. - the plug for the fluorescent light has a very short wire and the plug-in for the Breezair is on the opposite side of the unit from the Cellarpro so the wire will not reach the plug-in. I had to mount the light backwards with the switch inside instead of showing on the front of the light fixture. My BreezeAir cooling unit was faltering for thes second time in nine years so I decided to purchase another unit. I contacted Le Cache directly for a recommendation, I could have not been more pleased with my interactions with Le/IWA/CellarPro staff. They recommendated a CellarPro cooling unit which works splendidly (for the last two weeks) so far. I highly recommend working with CellarPro/IWA staff. After some online research, we decided to replace our second BreezeAir unit with a CellarPro 1800 QTL unit. A phone call resulted in a very well informed salesperson, who walked me through the ordering process. The replacement unit was promptly shipped and received. Installation was a snap. The new unit cools quickly, and is relatively quiet. So far, we are very pleased. This unit was used to replace my Breezair. It cools considerably faster and the noise level is lower. Had to replace my original unit purchased in 2011 with a a refurbished unit in 2013 while the original was under warranty. The refurbished unit stopped working not too long after the original 5 year warranty expired (late 2016). Customer Service personnel gave me a 25% discount (instead of the 10%) which I appreciated very much. I was simply expecting the unit(s) to last much longer. Hopefully third time will do it for me. Support personnel are great over the telephone as my installer had a few questions after reading the installation instructions. No shipment problems. The new unit works fine. So far, so good. I have a breezair with my stand alone wine unit, it went bad two times in three years, finally I decided to buy the cellerpro. it is a much better unit than breezair. We have a 200 bottle LeCache wine credenza that originally had a BreezAire cooling unit in it. The combination is nearly 15 years old. Even though the coolers are only supposed to last 6-8 years, we got over 14 out of ours. I chose the CellarPro after doing a lot of research, and finding the right fit. Nothing was exact, by the way. The CellarPro is larger, and it was pretty scary - even with as much custom woodworking that I do, to cut into a $5000 credenza. I had to make cuts on the back to adjust for the added width and height. Because of the added height, we lost space for 8 bottles of wine. But the unit's performance more than makes up for that. The ability to see the temp, make adjustments, and it's quiet running are all great improvements over the old BreezAire. The clips did not align with the old bolt holes, but this was really a non-issue, since you can use self-tapping wood screws to mount it to the inside top of the cabinet. It is also lighter than the old unit. Great unit. Had a little trouble installing and had to order the retrofit kit. Wish installation information on website was better. Purchased to replace an old Breezaire unit in a 15 year old wine cabinet. Installation was easy. After 7 years my original unit finally failed. After going thru troubleshooting guidelines I ordered new unit. It arrived within 7 days of ordering. Replacement instructions were very easy to follow, and unit is running as expected. 1 system is perfect Waiting for 2nd system. Pulled the old Breezaire out of my Wine Cellar Impressions cabinet, slide the new CellarPro in and now my wine is happy again. Unless you are 6+ feet tall and in good shape, get some help doing this. The unit was well pack and arrived quickly. It works very well in my insulated garage where my wine cabinet resides, and keeps a steady temperature while running quietly. I like to keep my wine at 55 degrees (I drink mostly red wine and I like to drink it at that temperature). I have a 180 bottle cabinet and so far I am extremely pleased as the unit seems to work exactly as described. I have a 2001 LaCache 400 that had a Breezaire 1060. It worked well until the unit started to freeze up a month ago. I called and talked with Joanne. She was wonderful in answering all my questions. When the unit arrived, it was 45 minutes from check out the new unit to pulling the Breezaire and installing the QTL. I did have a problem with the old clips. There was no way to grab a striped bolt. So I cut the old one and slid the clip a few inches. Also, save as much of the old sealant as you may need it. The unit is working very well so far. Service was excellent. Unit performing as per specs so far. This is my second CellarPro unit. My first was an 1800XTS for a different cabinet and the review of that was done on 7/30/14. There were a few minor problems fitting into my cabinet which I detailed in that review. The same things occurred this time but there was no surprise this time since the cabinet configuration is the same. Oh, and the Breezaire it replaced was just over 3 years old. Now for the disappointing part. My Breezaire 1060 was substantially quieter than this unit (unlike the 1800XTS which was substantially quieter than the Breezaire 2200 it replaced). The specs claim a noise level of 40.5 db. I have a dishwasher that claims 41 db and I can't hear it in the next room and barely even hear it in the kitchen. This unit can be heard clearly in the next room. However, other than the noise level, I'm not disappointed. Even I installed the 1800 QTL in no time flat! Really easy to install the replacement for a Breezaire 1060. It almost fit perfectly. With just a file to make the opening slightly larger, I had it in very quickly. The noise level is much quieter than the 1060! It cooled the cellar down is only a couple of hours. Well worth the money! I bought a 10 yr old used cellar with a Wine-Mate 2500 in it, the 1800 QTL fit perfectly and was very easy to install. Came with plenty of sealant (just make sure you roll it!). Unit works great and is very quiet. When my Breezaire 1060 died just after the warranty expired, I chose the CellarPro, avoiding any more Breezaire products. No problems installing this unit. Works well so far. My BA was toast w/out any hope of replacement. I did some on-line searching and found the CellarPro, called them up, and had it installed in a matter of days. Excellent service and product. The 'drop-in' replacement was slightly different. The existing clips I had required me to remove the front bezel of the QTL. That worked great. However, after the installation the bezel wouldn't quite line up with the fastening holes. The clips caused the bezel to be offset slightly. I managed to make it work but it would have been better to have the top of the bezel be 1/16" shorter than the unit. I wasn't quite sure exactly where the butyl caulking was to be placed for sealing - the intake, exhaust, or both. There wasn't enough to seal them separately but that was more than likely a user error on my part. A photo would have helped with that. Terrific customer service. Arrived in a timely manner, easy instructions to replace my old Breezaire 1060, very easy to install, fit perfectly and has been working great since I "plugged it in." Definitely recommend it over the Breezaire. I just wanted to say thanks for making the replacement of my old dead Breezaire 1060 so simple and easy! I followed all the directions in your Operator Manual and things went smoothly and easily. I had the Breezaire replaced with my new CellarPro in an hour, and this included removing the center post. You guys do a great job and I will most definitely recommend you to any of my friends who need to replace the Breezaire in their wine cabinet. Thanks again so much! I purchased the 1800QTL to replace my Winemate1500. The unit has the same dimensions as the Winemate1500, so the installation was simple. I did not have to make any modifications to the wine cabinet. It ran quieter, seems to work better, and higher quality. It well worth the price different. The sale rep. was quite helpful and knowledgeable. This is much better than just placing an order online. Good job guys and thanks! Great company & great product! My 1800QTL performed flawlessly before failing 4 1/2 years into the 5 year warranty period. It was quick and painless to receive a replacement unit. Much better performance and reliability than my old Breezaire. You cannot go wrong with CellarPro! I suppose I hold the record of Breezeaire longevity as mine lasted 17 years and survived two moves across the country. I researched both products, well, as good as I could research. Internet is not filled with chat rooms or blogs about wine cooling. The old unit came out easily and the new one went in just as easy. Super quiet compared to the older unit and the compressor is not running full bore like the last one did - it actually cycles on/off like it should. It is holding temp well after a little over a week and I have no issues. I like the power outlet on the side that permitted me to upgrade the lighting inside to an LED strip. So far so good, I would recommend this product for a replacement of Breezaire models. It would be best if we all could provide another review in 3-5 years and report performance. I won't give 5 stars, as I always believe there is room for improvement. Perhaps to increase longevity one could alter the construction of the components inside to prevent corrosion in either model, as I hear the lifespan on these units is about 10 years, give or take. I would think a simple compressor unit for the price paid here would be able to double that life span and easily get 20 years. Perhaps extending the warranty to stand by the product (10-15 years in lieu of 5). There's always room to improve or over-engineer a product like this to make it a "once & done" purchase for a wine storage unit. We HAD to replace our old Breezaire since it quit working. Come to vvind out, LaCashe knew it was a bad, inferior product. We did buy a replacement Celler Pro and it works find now. The only beef that I have is I asked for a discount - 5 or 10% to at least help with this new purchase. No, sorry we don't discount. That is BS. I know that they do discount if you are to purchase through a wine store. I found this out later. If you know something is bad, then at least try and compensate your customer a little bit. I am giving you a 2 star for this reason. Relaced a Breezaire unit which had failed after 3 years of use. Installation straight forward and very easy. New unit much quieter. Works great. The Grand Cru 800 cooling unit died in the Wine Enthusiast -BYO cabinet about 4 months after the warranty ran out. Bryan, at IWA, recommended the 1800QT. The unit arrived with no problems, and following all the instructions, I was able to modify the hole in my Cellar to accept the slightly larger 1800QT, and got it installed without any issues. (I just needed a drill, a jigsaw, and a screw driver). The 1800QT runs about 75% less than the Grand Cru 800 did, and it's much quieter when it is running. I am very happy with the purchase, and I am very pleased with the service I received from IWA. Bryan was in constant contact, with updates about shipping, and checking to make sure the unit was received in good condition. Read through reviews and comments and chose CellarPro to replace the Breezaire cooling unit in my Le Cache wine cooler. Shipped promptly and installed in about 45 minutes--perfect fit. Extra hands might have simplified, but not difficult to do by myself. Wow! What a difference!! This unit is super quiet and efficient. Extremely happy with my purchase. If you need a new unit this is it!! After fighting cheap systems for too long, I invested in this cooling unit. Since it's a little larger than the original systems some cabinet modifications were necessary, but nothing major. It's been in service for about a week and working well.. It's a little noisier than I expected, but other than that it works as advertised. My wine is now back down to the proper temperature and all is well. As others have noted, the remote bottle temperature probe is a must to keep the unit from cycling too frequently. So far, so good. This is working just as advertised. I had to replace my 6 year Breezaire in my LeCache Euro 3800 Z (back vented, purchased in Oct. 2007). I called LeCache and they recommended replacing with the Cellarpro 1800 QTL. It was delivered quickly, installed easily (about 45 minutes), and so far it's working great - hovering steadily between 58 and 62F (using a bottle probe). I like the placement of the digital readout and the controls. Just about a month in, but this is looking so far like a good purchase. Breezaire was on its last leg and wasn't able to keep the temperature below 60 so after comparing it to Cellarpro I went with the 1800QTL. Order was delivered quickly and promptly. Used the mounting clips from old Breezaire so if you are ordering a replacement you don't need to order the clips. Fit was absolutely perfect. Installation was simple and yes it does help to have a second person's help as you are in an awkward position lifting and supporting 60lbs. Also it was nice to find butyl tape in the shipment to complete the install. This unit is quieter than Breezaire. installation and setup was quite easy even though it required enlarging the rear opening. It operates quietly and effectively as well. Good product!! Although it was expensive to have our replacement unit shipped to our new home in Hawaii, we were very glad we made the purchase and had it sent. It arrived in just a couple of days as quoted, and it was fairly easy to install. It is so nice to have wine at that perfect tempeture again! Thank you for the assistance and excellent customer service. I needed to replace my Breezaire unit that finally went out. Great experience with Cellarpro from start to finish. Bronson was super helpful when I called and the order was processed and shipped quickly (good thing because we were in the middle of a hot spell). The unit looks and works great, extremely quiet compared to my old Breezaire. I only went 4 stars because I have to due some minor carving/sanding on my wine cabinet to get the unit in (the two screw heads and the external outlet plug on the sides of the new unit were just a bit too wide for me to slide it neatly in to the rear of my cabinet). I highly recommend this unit and Cellarpro for anyone looking to replace their old Breezaire cooling system. I had a Breezaire unit in a cabinet system that I had to have repaired twice. Third time it went bad (leaks in the tubes) I decided to replace it. When I got my new CellarPro in and did the recommended check on it, I discovered that it had apparently been damaged in shipment and one of the fans was not spinning. The service person I dealt with, Mike, was fantastic. He was very courteous and accommodating. After we decided the damage was something I couldn't repair, he was quick to email a shipping tag for me to send back the damaged one and my new unit showed up in short order. The installation was fairly easy, although having two people to do it is a good idea. The unit works great and the service was fantastic. I purchased this unit to replace a malfunctioning cold wall system in a Vinotheque cabinet. I didn't want to pay the $1400+ to repair that unit, so I removed it and cut the back of the cabinet to fit the 1800QTL. Not only did it go smoothly, but I much prefer the Cellarpro system as I don't have to call a refrigeration tech to constantly repair it. I was extremely careful when cutting the cabinet (which was only required in my case because I was doing an atypical installation) and I was able to complete everything by myself with no help. Bronson, Cellarpro, and IWA are all great and I'm extremely happy with my purchase. Great product. Well made easy to swap out from a Breezeaire. Very quiet unit. Customer service very helpful and informative. So far, so good. I am still surprised at the high price, which I don't want to think about. So it better keep on running! Power supply configuration and exhaust grill configuration were not clear from the sales conversation and required some adaption at installation. Easy to install, but it did take two people because of weight and slightly awkward. Instructions were perfect. So far working like a charm. My breezeair worked for 13 years, I'm hoping this lasts longer. On line assistance (Bronson) was great. Do not think I needed the new clips (only wasted $10)- also could have used more of the sealing tape. Finally got a chance to drop you a quick note. Got my cooling unit installed within a few days of it's arrival. Perfect "swap out" with the Breezeaire - only took a short time to install. Like the filter holder design - easy to remove and replace. Also like the side outlet for the cabinet light - much better than the hard-wired arrangement on the old unit. Kudos to IWA for developing a great unit - look forward to many years of service. It's great to have my wine at a "comfortable" 55 again! Thanks again for your help and prompt service! We replaced a Koolspace unit that was a replacemant for a previously failed Koolspace unit. I was not interested in replacing it again in 3-4 years so we decided to try this unit. It required some cutting as it is larger but that was the only inconvenience. If you get this unit be sure to get the mounting brackets. This saved time and aggravation and is worth the price. An inadequate amount of butyl tape for sealing was included. If directions are followed on cutting the hole size, 1/4" more than dimensions, the 1/4" gap on top requires a doubling of the already deficient amount of tape. (40" is included for a device with dimesions of 18x10.5) The documentation is not the greatest. The unit is quiet. Installed an 1800QTL in my 75 square foot wine closet this week. It seemed the perfect unit for my needs. It was heavy - about 60 pounds - for a 71 year old to heft overhead but I used a shelf rather than clips and it slid in easily. The shelf tilts back per the installation instructions. Ah, the instruction! They seem to be in random order. It took me forever to realize that the unit does not start when plugged in. There is an On/Off button. Is the max run time for the initial checkout 5 or 10 minutes? Depends on whether you go by the label pasted on the unit or the instruction booklet. I needed more than 40" of butyl tape to seal the unit -- would it have killed CellarPro to send 2 packages? And why after the test run must one wait 24 hours to turn the unit on for good? Also my unit was manufactured 6/12. I hope these units are not like orange juice with a useby date. All in all it looks nice and is easily cooling my closet - I'm in the Pacific Northwest where summer starts July 4th or later. I intent to lower the preset of 58 degrees to 55 degrees but the instruction say wait 2 weeks. So far, so good! Like others, my old Breezaire (top vented) went out and I replaced it with the 1800 QTL. Delivery was very prompt. Unlike other reviews however, the unit fit perfectly with no modifications to the back wall. Directions on this web site and with the unit were very good. I did the job myself, but can see where another pair of capable hands would have been helpful. Tips: start in the back, remove the grill and light connections (install a plug to the light as mentioned in another review); loosen the ceiling bolts/mounting clips ~3/4" but no need to remove - the old unit can be shifted side-to-side and lowered; as mentioned elsewhere, remove the front grill of the 1800QTL as this makes connecting the hanging clips very easy. Also, check all of the gaskets and seals - I had to replace some of the metal contact surfaces as they were warped and created gaps. This may have contributed to the demise of the old Breezaire, but may also have resulted from the cellar being "warm" for a week. CellerPro quietly reduced the temperature to 58DegF in less than a day despite the almost full cellar. Currently the fan doesn't turn off following the cooling cycle, but everything else works great. I replaced my Breezaire 1060 unit after 15 years. The customer service rep was extremely helpful with the specifications and features of the CellarPro 1800QTL. After two weeks I'm very happy with the unit, which was easy to install, but needed a second person to put it place. The instructions were very helpful and like the LED temperature readout, which I didn't have on my Breezaire. I replaced my cooling unit after about 8 years. The new CellarPro works great. Easy to install. Used this to replace my 25 year old Breezeaire. Customer rep was very helpful in finding the correct unit for my wine closet. It fit perfectly and the instructions were well done, and its working great! Like previous reviewers, I had two failed Breezaires and didn't really want to go that route again. Researched the 1800QTL and it looked like a better choice. I needed someone to install it for me, and he and his helper got it in with no problem. So far it's working perfectly and is very quiet (it's in our family room). There's just a subtle hum when it's running. Like many other previous reviewers, I replaced a Breezaire WKCE 1060 for my credenza cellar unit. The Breezaire unit was only 7 years old and had been running noisily at 65-67 degrees for the last 10 months (I emptied out the cellar during most of this period). I was advised not worth repairing the Breezaire. For $200 more, I was recommended by an independent dealer to replace it with a CellarPro instead. The CellarPro was installed by a serviceman. He had to enlarged the rear window by 3/8 of an inch. He also had to install an electrical plug to plug-in the light inside the cellar. I have the CellarPro unit for more than 3 weeks now. So far, I am quite happy with the CellarPro unit. It runs very quiet and maintains a constant set temperature. I also suggested the same CellarPro recently to a friend for replacing a Vinotemp cooling system. After two failed Breezaire units under warranty, I upgraded to the CellarPro. Installation in my LeCache cellar was direct and easy. the new unit is quiter and is working as advertised so far. I like the additional operating features and display information. Delivery was very fast, just a couple of days. Installation in my cabinet may have been possible with one person, but it was extremely helpful to have 2 as the 1800 is somewhat heavy and bulky. I removed the old Breezaire 1060 from my cabinet without difficulty (good ridance). I found it necessary to cut ~1/8 of an inch off one edge of the cabinet opening in order to fit the new Cellarpro unit into place. (NOTE: if you install the cooling unit from the front, it will fit perfectly.) The caulking material provided was easy to apply around most of the unit. On the front edge I did need some additional weather stripping that I picked up at the hardware store. With installation complete I turned it on. Works like a DREAM. So efficient. It cycles on about 60-70% of the time to keep my wine a comfortable 57. ( We only air condition the house down to 78.) Drastic improvement over the junky Breezaire unit. I should have replaced it years ago. I replaced a worn-out Breezeaire 1060 with this unit. Installation was easy...it is a good idea to get someone to help with lifting the unit into place, since it is heavy and you don't want to damage the cooling fins on the back. It works great, is quiet, and doesn't have to work hard at all to maintain proper temperature. Installed my Cellar Pro 1800 this morning by myself and I must say it was pretty damn easy. Nice suprise. I was a little disappointed to see it show up on the delivery truck on it's side, especially since all of the litature says not to do that. You might want to think about adding to your directions to remove the front grill when installing. It makes it very easy to install the clips that way. Now let's see if it lasts. I purchased the CellerPro 1800 to replace the unreliable Breezaire 1600 in my Le Cache 2400 cabinet. The CellerPro is performing well; however replaceing the Breezaire was difficult. The CellerPro is ever so slightly larger than the Breeziare and would not fit into the back mounting bracket. I had to pry the bracket wider to accept the CellerPro. Other than the installation problem, the unit is working well. We have been quite pleased with our new CellarPro cooling unit. It arrived promptly, was easy to install, and is keeping our wine at the selected temperature. The delivery was prompt. I replaced a breezaire 1060 and it could not have been easier. It has nice controls, but the best part is set it and it works great. The unit did not work when it arrived. The power cord was improperly installed. They sent me a new cord and refused to reimburse for the cost of my electrician disassembling and re-assembling. Telephone manner was terrible. They seemed to imply that I must be crazy to think that they're product was not getting any power. We also replaced an old Breezaire unit with we had continual problems with. This unit is nice, sleek, and very quiet. The instructions were clear but we thought the kit that came with did not have enough sealing putty nor clear instructions as to how to use it. This is my very first wine cellar cooling unit. The instructions made sense and the installation was as easy as could be expected. The unit is quiet and seems to work very well. The room is only about 45 cubic feet and the unit is rated for 80 cubic feet so it's good it cools quickly and efficiently. NOW the PROBLEMS! To my knowledge just about EVERY application for this needs a drain!! Why this wouldn't come preinstalled is a complete JOKE! It seems they want to price the unit as low as possible and then sell you all the "optional" accessories that are actually a necessity at a much higher price than they are worth! Thankfully I am smart enough to install my own drain and not be taken advantage of by their $75 factory or $100 after delivery kit. Price the unit complete with all that is needed! Very pleased with the performance so far, and it is no louder than the Breezaire it replaced. Straight forward controls, and and easy exchange of old to new unit without any modifications. I just hope that I get more than 3 years out of this brand than the last two Breezaires. fit perfectly where the Breezaire unit was. Very quiet. Installation instructions clear and straightforward.